I watched all the 13 episode of The Walking Dead Season 2 just recently but I’m too excited to see the Finale Season because of this new character wielding a Japanese sword with two walkers slaves. A mysterious character who save exhausted Andrea my walkers in the last minute of the last episode of season 2. After the walkers invasion at the farmhouse on that night, Andrea, who was left behind was chased out into the woods all alone by few walkers, fighting tirelessly to escape. When I thought she was going to be eaten, the walker who attacked her gets his head chopped off and falls over, and that’s when the hooded character was revealed. 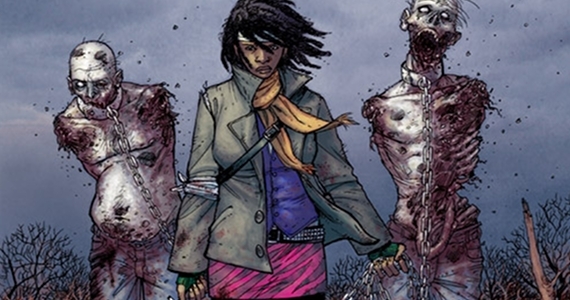 The name of the mysterious new character is Michonne, from Robert Kirkman’s comic book series, a black woman armed with samurai sword instead of a gun instantly makes her a fan favorite. The Walking Dead Season 3 will feature 16 episodes and scheduled to release in Q4 of this year.